It’s widely advised that you should exercise at least three times a week for a total of approximately 150 minutes. But do you know the ideal amount of exercise you should get to increase your chances of living a long, healthy life? Participants in a recently published 14-year study who performed moderate exercise for 450 minutes per week — a little more than an hour each day — had a 39 percent lower premature mortality rate than those who didn’t exercise at all. Participants who exercised the generally recommended 150 minutes per week still had a 31 percent lower risk of early death during the study than those who never exercised, but the benefits and longevity were highest for those who spent 450 minutes per week exercising. Go for a walk — Sometimes the simplest option is the best option. 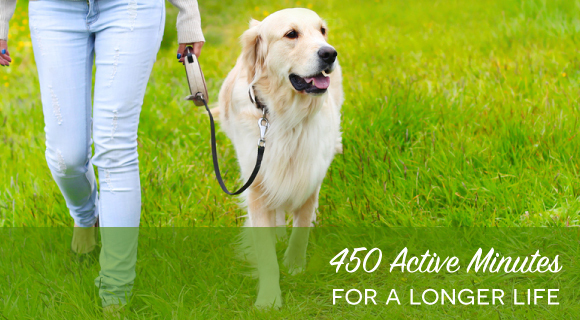 Take the dog for a long stroll or invite a friend, family member or colleague for a brisk walk. Even walking in place during a 30-minute television show counts! Join a team activity — Having a companion helps with accountability and motivation, and it makes exercise feel more like fun than work. Try joining an exercise or dance class or signing up for a social sports league. Take the active approach — When given choices like taking the stairs or riding an elevator or parking close to your destination versus slightly farther away, choose the stairs and extra distance. It won’t feel like much, but it helps those active minutes add up. Before starting any new exercise program, it’s always a good idea to talk with your health care professional.